MILPITAS, CA and BANGALORE, INDIA--(Marketwire - February 16, 2010) - Kovair today announced that it has reached a definitive agreement with Vedasoft Consulting Services based in Bangalore to immediately start representing Kovair in the India market for the sales and services of its entire product line. Vedasoft, based in Bangalore, was founded in 2007 and to date has focused on the sales and services for the SAP product line which it will continue to focus on as well. Besides Bangalore, Vedasoft has offices in Hyderabad and Chennai which will give Kovair access to some of the key IT markets in India. "Vedasoft's experience in dealing with some of the enterprise customers with SAP solutions and their presence in key markets is of great value to Kovair and we welcome our first such partnership in India," said Bipin Shah, CEO and Chairman of Kovair. "We look forward to a long term relationship between Vedasoft and Kovair for continued growth of our business in a key market such as India," continued Shah. "Our presence in the vertical markets such as Manufacturing, IT, Communications and Education should be of considerable value to Kovair in providing them a jump start with these organizations," said Vijay Talluru, CEO of Vedasoft Consulting Services. "After a review of the Kovair Solutions, we were convinced that it is a great product for the market and we are very enthusiastic about investing our resources in promoting this product line," continued Mr. Talluru. Potential customers can contact Vedasoft Bangalore office at 080 3240 7470. For any Kovair related information, please contact Mr. Jhilam Nandi at the Kovair Kolkata office at 033 2357 2588 and by email at JNandi@Kovair.com. Kovair Software is the innovation leader in global Application Lifecycle Management - ALM and IT Service Management - ITSM solutions, supporting globally distributed multi-site application development and service. Its flagship product, Kovair Global Lifecycle, is a web based, feature-rich, configurable, development platform with built in workflow and integration framework that offers a complete set of integrated tools and processes for managing the entire lifecycle. With Kovair's Omniprocess, Workflow Automation Technology the solution includes built-in Software Development Life Cycle - SDLC applications like Requirements Management, Issues Management and total ALM Solutions. IT Service Management applications include the Service Desk, Incident Management, Problem Management and Change Management. Kovair's integration infrastructure -- Omnibus, Integration Bus Technology for third party tools provides customers with an extremely flexible and globally integrated IT environment. Kovair solutions are available both On-Premise and Software as a Service-SaaS offerings. Kovair Software has offices in Silicon Valley, California; Kolkata, India and Melbourne, Australia. Vedasoft Consulting (www.vedasoftconsulting.com), headquartered at Bangalore, is a Global provider of IT solutions with presence in India, Singapore and the US. Being a SAP Channel partner, they are focused on ERP software and consulting business. Vedasoft takes pride to work with world leaders in the respective industries like Manufacturing, Infrastructure, Education, and new economy industries such as Information Technology, Telecommunications and the Service sector. Their core competencies are Application Development, SAP Practice and Corporate training. For more information, visit www.kovair.com. 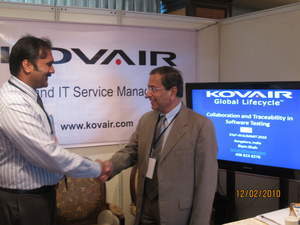 Kovair CEO Bipin Shah (right) and Vedasoft CEO, Vijay Talluru (left) shake hands in Bangalore, India on February 12, 2010.